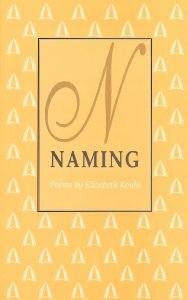 A PECULIAR NORTHNESS informs these poems about Elizabeth Kouhi's own life as a Canadian-born daughter of Finnish immigrants. Ten years have past since Kouhi published her first volume of poems for adultsRound Trip Hometen years have past in which she concentrated on writing for children. In Naming, Kouhi reconsiders not only her childhood search but an entire community's collective struggle to find Home. We dance with contrapuntal images of the artsmusic, poetry, painting, sculpturewhich she views as endangered species. Finally, we return like refugees to green woods, northern gardens, and grandchildren. Elizabeth Kouhi is of Finnish ancestry and lives in Thunder Bay, Ontario. A retired school teacher, she still regularly visits elementary schools to enchant young children with samples of her northern verse.